Susana Arenas Pedroso, former principle dancer with Raices Profundas teaches Beginning Cuban Folkloric Tuesdays at 8pm and Int/Adv Cuban Folkloric Thursdays at 6:15pm at Dance Mission. She also teaches Beginning Salsa Wednesdays at 6:30pm. Listen to the Crosscurrents, KALW Podcast, Afro-Cuban Movement with Meaning. 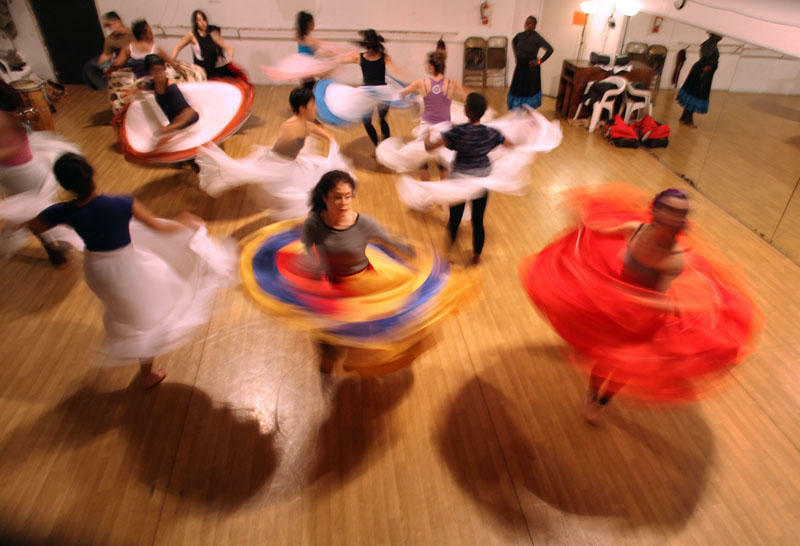 Dancer Stella Adelman says just that about going to Afro-Cuban folkloric dance class. “There’s a release to it,” she says. To her, it’s a place where she can reflect and find some clarity through movement. To some practitioners this clarity comes from being active and getting exercise, for others, it’s literally a spiritual practice. 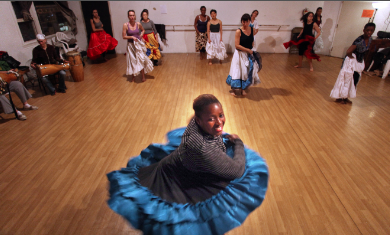 The Bay Area is home to many instructors of Afro-Cuban rhythms. Music and dance lovers come from all over the world to participate in workshops taught by some of the most loved teachers and dancers from the Cuban Diaspora. Many of them have found home here. Inside the dance studio at Dance Mission Theater three drummers sit next to one another in an echoing dance classroom. Each has a drum shaped like a giant hourglass laying across their lap sideways. With each smack of their hand it looks like they are scooping air into the drum’s leather head. Susana Arenas Pedroso is the instructor of the class. She’s standing in front of a group of about 10 dancers while explaining the roots of the Cuban Orisha, or God Ellegua. Pedroso was born and raised in Havana, Cuba. “Orisha is the way we walk, eat, the way we express,” Pedroso says. Pedroso is a well known teacher in the Bay Area, a place that has built a reputation for having world class Afro-Cuban folklore instructors. Like many teachers here, Pedroso is a former dancer from a Cuban dance company that went on tour in the US. She decided to stay. Pedroso explains to the class today that Afro-Cuban rhythms are rooted in Africa, from the Yoruba people. In the very Catholic colonized Cuba, African slaves were forbidden to practice their Yoruba religion. The Spaniards forced them to adopt Catholicism, but many slaves silently refused and came up with an alternative. Pedroso is remembering visits to a Catholic Church in Havana that has a double life. It is also the church of the African Goddess Yemanya. In Cuba, they call this syncronism. Some Cubans go to the Catholic churches to pray but they’re actually be worshiping African Gods using the images of the Catholic ones. The syncretic religion has a name: Santería. Today about 10 dancers are in class, all wearing long flowing skirts. This is an advanced class so they know very well that Yemanya is the mother of all things and she represents the movement of the water. The dancers’ skirts twirl in unison, sounding like flags in the wind. They create a colorful room of movement. The dancers’ faces are proud. Confident. Maternal. This Orisha means business. Usually Yemanya is calm like a Caribbean wave but when she gets agitated, she swirls around, and kicks her feet. Like the ocean in a storm she turns from smooth and easy to a turbulent defiant force. “When you dance for Yemanya and your skirt is like the waves and crossing the floor and singing and hearing those drums, you can’t not feel the spirituality,” says Parousha Zand. Zand is one of the dancers that comes to the class frequently. Like some of the other dancers she often brings her son with her. The kids sit in the corner surrounded by twirling colors as bright as their crayons. Zand tells me she doesn’t come because she practices Santería. religion. For her the dance is just a physical and mental release. “I think it’s like, I’m a nurse and I deal with sick people a lot of the day and not thinking about any of that and just going back to feeling and being in your body and not thinking so much,” Zand says. The dancers line up and move across the floor. Their shoulders roll like waves. The women in the class today completely embody this Orisha Yemanya. Still, most of them tell me they aren’t actually followers of the Santería religion. Including Stella Adelman. “I’m a white American Athiest Jew but here I’m doing a religious dance,” says Adelman. She says she loves the stories and movements of Afro-Cuban folkloric dance. Adelman’s been dancing the genre since she learned about it years ago on a visit to Cuba. “I love Xango, who is the Orisha of lightening and male sexuality. The way the rhythm and movement fit together, it’s a sweet spot for me,” Adelman says, holding her fist in the air as Xango often does. Adelman says she feels moved by the class even if it’s not her chosen religion. “I think you see a lot of Jews who practice Santería, because you can have it [Judiasm] part of your culture and not your belief system. A lot of people say, oh, you are a Jew-Bu, like a Jewish Buddhist—I don’t know what you’d call it? A Jew-Santa?” she laughs. A few people are very aware of how this class overlaps with and departs from Santería.. One of them is Carolyn Brandy, she’s one of the three women playing the Bata drums. Brandy is tall, and has peppered grey hair. She commands the attention of the room when she plays the drums. In a traditional Santería ceremony, sacred drums that had been blessed would only be played by men. Brandy knows these religious rules well. “I’m a Santera, I became a priest in Cuba in the year 2000, and I’m a priest for Obatalla- the Orisha of the mountains,” says Brandy. Not many dancers in the class realize that Brandy is a priest, to many she’s just the drummer that seems to play all of the rhythms with ease. Brandy says these sessions are part of her Santería practice. “I have Native American blood and I’ve always believed the powers of the earth are sacred … [This religion is] very firmly rooted in music. I like that it’s beautiful. You don’t have to be Cuban or African. It’s something that touches the human being-ness,” Brandy says. I tell Brandy about my experience living in Cuba. A place that I know well; I spent years studying there, and it’s where I went to my first Santería ceremony. Neighbors and friends crowded in a small living room. Men wearing white played Batá drums. A woman began to dance– slow intricate moves that turned into convulsive like movements, shaking and screaming. Eyes wide. I was told she’d been taken by the spirit. Carolyn Brandy tells me this wouldn’t likely happen at the dance class, but she says there are places that you can experience this deeper side of Santería in the Bay Area. Like at her home. I visit Brandy in San Leandro, and she invites me into her living room. It’s like walking into a shrine. Altars to gods line the walls. Brandy recently had a religious ceremony at her home. She moved out the tables and chairs, set up drums and people dancing were overcome by Orisha’s in the middle of her living room. “Healing.” That’s the same word some of the dancers at Dance Mission Theater use to describe the experience of their Afro-Cuban Folkloric classes. As the women drummers begin to play, and the dancers follow teacher Susana Pedroso across the floor. Some of their faces begin to twist and change, some of their eyes widen and the drums respond with more force. People begin to sing the call and response of the Orisha’s. Some people know the words to the Orisha songs and others just improvise, moved by the need to let something out, no matter if it’s a part of their religious practice or not. To learn more about Cuba Caribe music and dance festival, click here.